Shop for Monster Jam tickets right now and discover a huge selection of race tickets available. Purchasing Monster Jam show tickets here is simple, safe and secure. 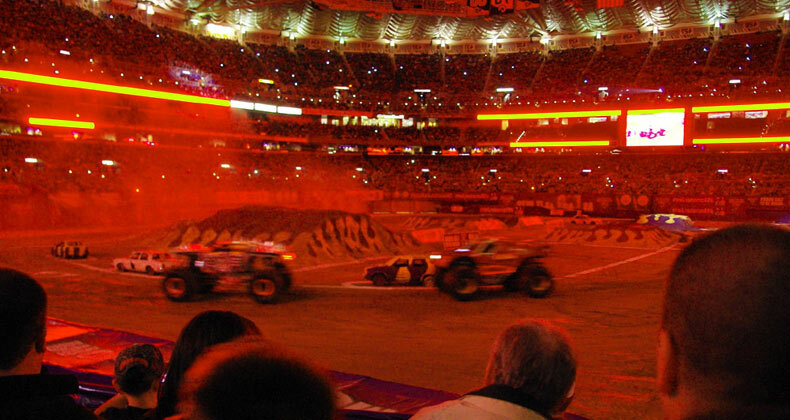 Either choose the Monster Jam race above by clicking the 'Tickets' button or call us at 1-866-837-0608. Above is the Monster Jam event schedule. Click on any of the red 'View Tickets' buttons to see all the available seats for that Monster Jam event, along with an interactive seating chart that will help you locate the best seats for your price. You'll have to choose how many seats you want to purchase for the Monster Jam event, and then you'll be brought to our secure checkout. We offer a wide range of Monster Jam tickets here. For instance you can find start/finish line seats, granstand seats, tower tickets, premier club, club loge or club MVP seating. Other types of seats you can find here include upper and lower concourse tickets, general admission, pit in and pit out seating, luxury suites, box seats and Monster Jam e-tickets here too. The roar of the truck engines, the massive wheels, the flying mud, and the cheers of the crowd. This is the Monster Truck Jam experience and you are just a few clicks away from your tickets in! All our Monster Truck show tickets are 100% guaranteed. 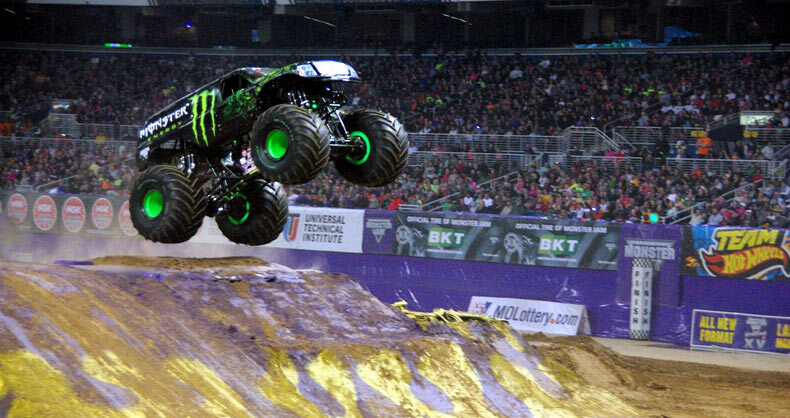 Monster Jam race ticket prices may be above or below face value and can fluctuate. You'll find tickets here at relatively affordable prices. To find the current pricing, click the red 'View Tickets' button above. You'll be brought to the seating chart where you can sort from the cheapest to the highest pricing. Discover a wide range of cheap Monster Jam tickets, including discount seats or last-minute and low-priced deals here. You can rest easy because all our tickets are 100% guaranteed. All ticket sales are final. Our Monster Jam race tickets are unique and can't be replaced, therefore there are no exchanges or refunds. If an event is rescheduled or postponed, your tickets will be honored for the new date. Learn more. You can choose either standard or express delivery and you can specify special delivery instructions if necessary. Your tickets will be shipped to you using Federal Express. Also, some Monster Jam tickets may be available for immediate download as e-tickets, or electronic tickets. They have names like Grave Digger, Batman, Gunslinger, Maximum Destruction, Taz, and Madusa. No they aren&apos;t professional wrestlers or members of a biker gang, they are names of monster trucks that compete in the very popular Monster Jam. This exciting live motorsport is more than just "trucks go smash!" It&apos;s an actual sanctioned competition that awards championships. Monster Jam operates under the auspices of the United States Hot Rod Association. The events, mainly held in the United States, feature two main disciplines, racing and freestyle. 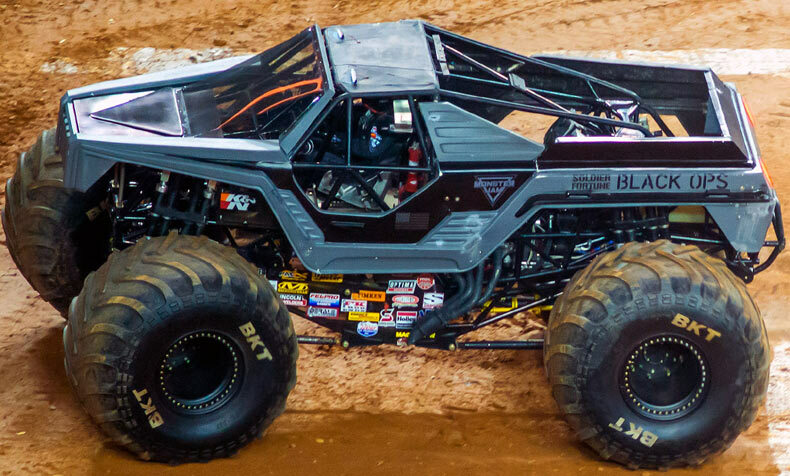 Events are held all year around, but Monster Jam&apos;s competitive season runs from January to March, with a few events in the November. In the off season, the circuit has been known to hold 10 events, each in a different city, on the same weekend. In the summer and fall, Monster Jam will tour Europe. Domestically, the circuit hosts a series of events called Summer Heat. Monster Jam holds its World Finals every year in Las Vegas in late March. This event crowns champions in both the racing and freestyle categories. Tom Meents has dominated the competition. He&apos;s won eight championships, four racing and four freestyle, including the first three racing titles ever awarded. In the inaugural freestyle championship of 2000, Dennis Anderson scored the competition&apos;s only perfect score of 40. Monster Jam has its own television show on the Speed Channel. The program has aired on the network since 2003. Mattel produces a line of Hot Wheels dedicated to the vehicles from Monster Jam. Up until 2008, the toy manufacturer sponsored its own monster truck. The circuit has also been turned into a video game. Since 2002, publishers have released four Monster Jam related video games on a variety of formats. First time fans are urged to bring ear protection or be prepared for the loud rumble of the trucks. Since most of the events are held indoors, the monster trucks can get very loud. Spectators should also be aware of gas fumes.